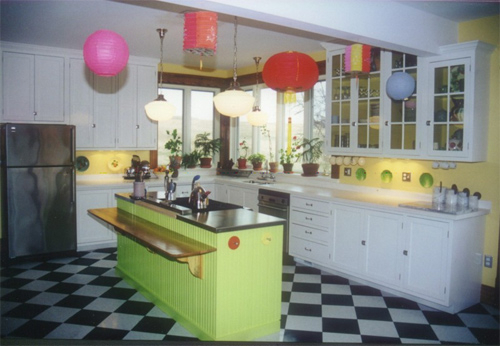 I was surfing through a few of Google’s images for ideas for kitchen cabinet designs and came across this colorful clashing mess. I know when I first saw it what I thought…WHOA! I paused to consider and then reconsider what I had just seen. I made this post today to see what our reader’s thoughts are on this particular design. Is this kitchen too busy? What needs to be added or taken away? Would you buy a home that looked like this? There are a few things I would certainly do differently. For instance, the pink, orange and yellow things hanging from the ceiling would have to be removed. I would also paint the island cupboards white. I think with those few changes, this could be a semi-attractive kitchen again. One more thing, the plates hanging on the wall-splash area would need to come down too. The one thing I found to be odd is the drop down bar area. I personally think it is an eyesore. Perhaps it would have looked better if it was the same color (black) as the higher counter top. It’s just a strange arrangement. The addition of that drop-down area created three different colored counter tops in this already busy kitchen. Kitchen cabinet color accents should be kept to a minimum. How many different colors should be used when designing a set of kitchen cabinets? Do you think that they have too many clashing colors in this kitchen cabinet design? Maybe your thoughts are different than mine. Perhaps you like colorful accents that clash with one another. I just really think that this one has way too many frightening things happening in one area. I would love to hear your thoughts about how they used colors in this kitchen design and what you would do differently. That is a really bright green island cabinet. You are totally right, it just hits you in the face as being clashing with everything in the kitchen. A little too flashy for my tastes. I say paint the island cabinet white and remove the hanging decorations and the kitchen would be presentable. Still, there are several other things that could be eliminated to make it look a lot less busy. I love the playful display of colors , from that Nile green color of the island cabinet to the colorful hues of those Chines lanterns. The white cabinets neutralizes everything,I must say. Being a Decor Addicts, I have to say this to you; you did an amazing job. Thank you for sharing it to us.